We do full exterior maintenance for homes, interior/exterior construction, multi-family properties, and businesses. We offer gutter and roof cleaning. 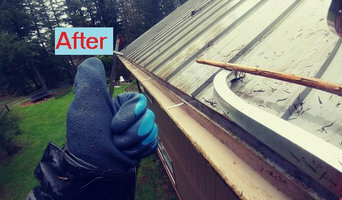 gutter guard installation, window cleaning (interior and exterior), pressure washing, and holiday lighting installation and removal, siding repair/replacement, roof repairs, any interior remodeling. All-Clean! Soft Wash is a family owned and operated business that has been loyally serving the Gresham, Sandy & Portland Metro area for over 30 years. Specializing in residential homes and commercial properties, we take on each job with utmost care, paying close attention to the details. We always remove our shoes when entering homes, and take special care around your furniture and landscaping. Bottom line – we do our best to treat you like we would want to be treated! You have a busy, hectic schedule. Take some of the frustration out of your home-care, and trust your windows to us. We offer a fully backed up satisfaction guarantee they will be the cleanest you have ever seen them! We don't just clean your building, we treat it. That is why our cleanings will last 3-5x longer than our competitors cleanings. Many contractors will make you sign a disclaimer releasing them from liability in the event that they damage your property with their pressure washers - but you won't find that on our bids. Our revolutionary SoftWash Systems cleaning method is effective and safe! We maintain a drug free workforce and have the highest standards for quality. We are fully licensed, bonded, and insured for $1,000,000.00, members of construction contractor's board (#99251), comply with workman's comp laws, and have a drug free work force. We guarantee our work as well as offering the best prices in the state. We will meet or beat any price of any company in the state with identical credentials to ours. Try our service and you will agree, calling the Big Gun is the best decision you will ever make when it comes to care for your home or business! UpRight Exterior Services provides professional power washing services, for driveways, siding, gutters, garage floors, fence, deck, brick and more. 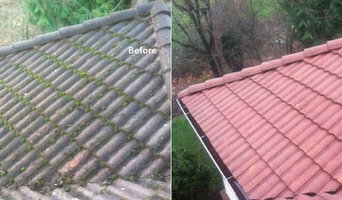 We have recently expanded our services to provide Soft Wash Roof & Gutter Cleaning. We pride ourselves on accuracy and reliability and can process your bid based on a photo sent by email or text, we will price your needs quickly and fairly. Moss City is a local roof and gutter cleaning company. We are located in Damascus OR but service the Portland metro area. We specialize in roof cleaning and gutter cleaning, but also wash home exteriors, driveways and hardscapes. At Moss City our standard is to provide a level of workmanship and customer care that we ourselves would desire. 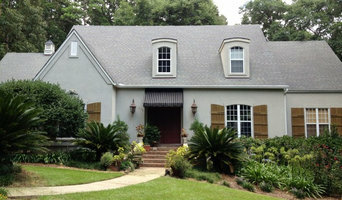 Curb appeal cleaning services is a small family business focused on customer satisfaction and top-quality craftsmanship. We provide exterior services for residential and commercial properties that include roof cleaning, moss removal & treatment, pressure washing, gutter cleaning, and window cleaning. Our satisfaction comes from building good relationships with our customers and knowing they are satisfied with the work we have done. Improve your homes value and curb appeal with our services! . Services tailored to meet your specific needs and wants. . We do anything from cleaning your roof and gutters, siding, to your concrete, decks and fences! NW Pressure Washing Service LLC started business in 2019 and operates out of Salem, Oregon. When establishing our company we realized there was a great need in the area for pressure washing services. Being in Oregon, mold, moss and mildew are prevalent on homes and businesses. At NW Pressure Washing Service our mission is to help clean and beautify the places you value most. We service a 50 mile radius around the Salem Metro area. Our technicians are qualified to diagnose the problem and treat the issue accordingly. With our highly efficient industrial equipment, we can ensure the job is done quickly, and thoroughly. As a small business we strive for the best customer service. We believe a small business should reflect the community it serves. Therefore, we give back to local historical properties including churches, schools and homes in order to keep our community and state beautiful. Each month we offer free services to selected historical properties to make them shine again like they once did. We hope to see you soon and put a smile on your face. Jet Clean is all about quality and efficiency. With 20 years in the cleaning industry, you could say we have a drive to keep things spotless. We’re licensed, insured, and bonded. We will give you a free quote on any project you have, whether you need your fence soft washed, your driveway pressure washed, or your fleet maintained, we can do it all! 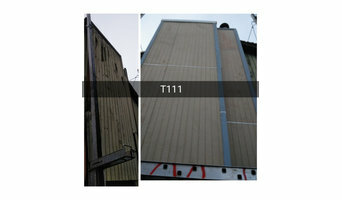 Your satisfaction is so important that we guarantee that every project exceeds your expectations. All Day Projects is here to serve you, our customers. We offer convenience, better prices, and unmatched service. Our company offers a wide variety of service such as: window washing, gutter cleaning, pressure washing and Christmas light hanging. Our top notch service is here to make your experience comfortable and economical. As we grow as a company, our goal is to offer every service that is needed. This will include but not limited to: cleaning of rental units, painting, locks smith services, trash outs, carpet cleaning and installation. Customer satisfaction is our primary concern. We appreciate your consideration and we look forward to hearing from you soon. We are committed to providing the highest quality products and services. We believe that quality customer service is the key to a successful and prosperous business. Each one of our customers is treated as family, and we look forward to serving your home soon. Expert Pressure Washing and Maintenance prides itself in great quality service. Our mission is to give the highest level of service, and leave our customers satisfied. Locally owned and with experience in the exterior cleaning industry, we are the experts you need to take care of your home or business. We will treat your home as we would treat our own. Give Expert Pressure Washing and Maintenance a call today, we look forward to working with you! What do Tualatin, OR exterior cleaners do? Find exterior cleaners in Tualatin, OR on Houzz. Search the Professionals section for Tualatin, OR exterior cleaners or browse photos of completed projects and look for the exterior maintenance professional’s contact information.